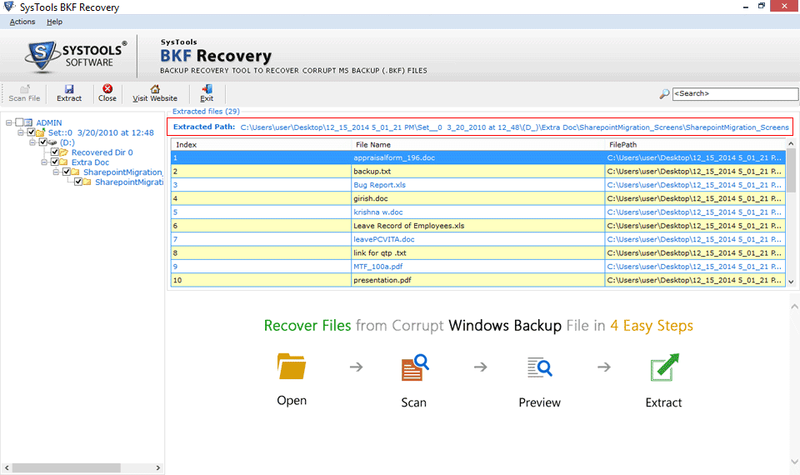 BKF File Restore Tool allows the user to repair corrupt BKF file and extract entire data from the backup file which includes images, documents, music files and all other items. This software provides different scanning modes depending on the level of corruption of backup file. If the file has mild level of corruption then choose Quick Scan mode and opt for Deep Scanning if the backup files are highly corrupted. To recover selected files, choose Range based Scan. BKF Restore Tool recovers data from VERITAS Backup Exec by Symantec general backup file apart from Windows NTBackup. This is the reason why this software is used widely for BKF File Recovery. While you scan corrupt windows backup file, it saves the scan and the next time when you want to start same process then simply load the file and that saved scan will be loaded saving the scan time. If your windows .bkf file is damaged then you can repair it with BKF Restore tool. It helps you to extract data from BKF file completely. This software can recover windows backup file data without losing any information from it. BKF File Restore Tool allows you to check or uncheck the files or folders of backup file which you want to recover from damaged .bkf file. Doing this, software will extract only selected data from it. When BKF File Restoration is completed, the software will list all the recovered items to view .bkf file. You can even search for a particular item within backup data by using file extension or file name. To save data from BKF file, BKF Restore Software offers two options for data extraction. You can either save the file at original location our save that data at desired location by browsing it. This feature comes handy when you want to scan the selective portion of your backup file. You can define a range in percentage between ‘From’ and ‘To’ and start scanning. BKF Restore Tool does not impose any file size limitation while you fix BKF file. This software can repair corrupt windows backup file of any size. Infact, it is tested successful recovery of upto 30 TB of .bkf file. Hard disk space : 15 MB of free hard disk space required. 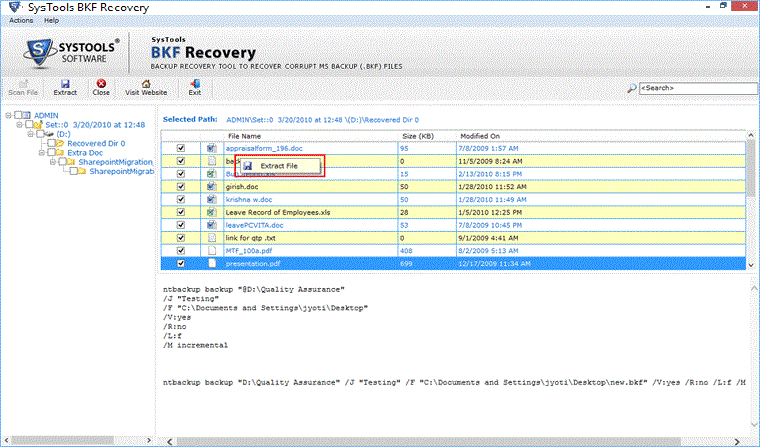 Trial Version of BKF File Restore tool generates a preview of recovered data of backup file. I have a Windows .bkf file on my machine having Windows 8 running in it. Can I use this software? 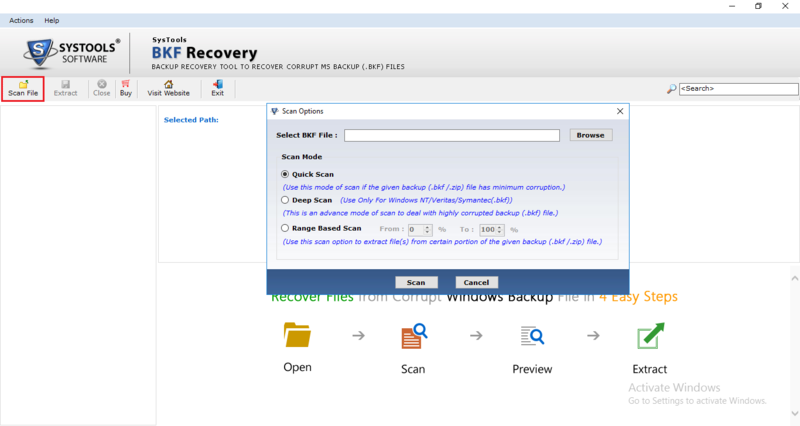 Yes, you can use the BKF File Restore Tool on any Windows machine and repair corrupt windows backup file. I have windows backup file of pretty large size. Is there any file size limitation of BKF file to repair? No, BKF Restore Tool does not impose any limitation on file size of the .bkf file. 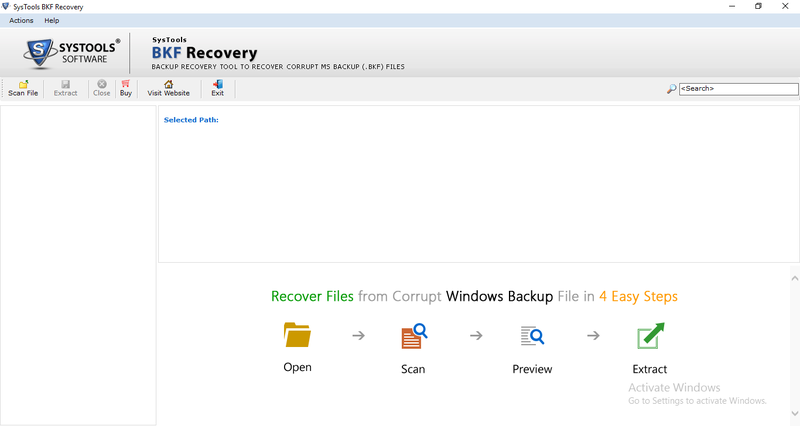 You can save and recover corrupt windows backup file of any size. Does this application restore data too? Yes, you can restore/extract data from .bkf file. You can save that data to the original or the desired storage location wherever you want. By using the demo version of this tool, Can I save some amount of data? No, you cannot save data using the demo version of BKF Restore Tool. There is limitation of the trial version that you can’t save any data from backup file. You have to activate the full version of this utility. 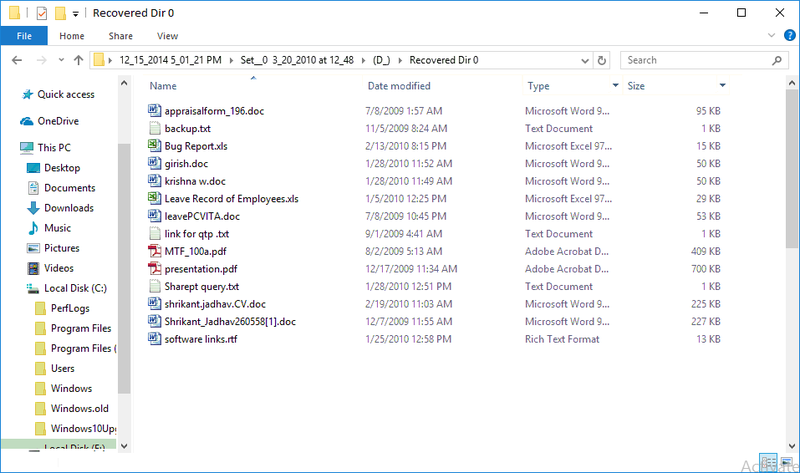 Can I recover my .bkf file of Exchange Server too using this application? No, you cannot perform recovery of your exchange bkf files using this software. For this, we have one more tool. You can try this Exchange BKF Recovery Tool. Can this software repair multiple .bkf files at a time? No, this tool allows you to scan and repair only single backup file at one time. However, you can add multiple .bkf one by one to recover them. I was so tensed about how to restore data from .bkf file until I got this BKF File Restore Software. I got perfect solution to fix corrupt BKF files and I wish to show my gratitude towards the development team and the support staff. I created a backup of my crucial presentations to be on a safe side in case I lose my original data. But when I tried to restore data from BKF file, it threw an error showing that the file is corrupt or unavailable. Then one of my colleagues suggested me this BKF Restore Tool and this application became the saviour of my presentations. I really liked the working of this software due to its accurate and speedy operations. I was searching for the same kind of utility as my windows backup got corrupted due to some virus attack. One more amazing thing about this software is its user friendly interface which makes it so simple to use.